A Digimon that was transformed into a half-beast, half-man form when Wolfmon's power was halved. 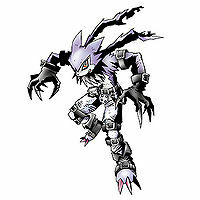 Because it has not lost its "Combat Instinct", unlike the similar half-beast, half-man Flamon, it has a ferocious side. For that reason, although it has the appearance of a Child Digimon, it will sometimes rampage enough to be out of control even for the typical Adult. 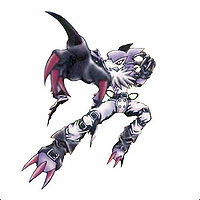 As with Flamon, although its power was decreased, it seems that Adult-class Digimon aren't a match for it. 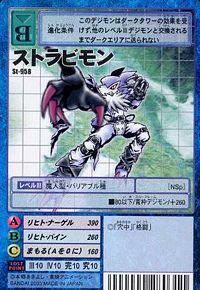 Its Special Move is cutting the opponent to pieces with the shining claws on its hands (Licht Nagel). Title: 「仔狼」 — "Wolf Kid"
2} For fur, to bristle. Slices up its enemies with claws on both arms that radiate with light. Hits its enemies swiftly like a ray of light. 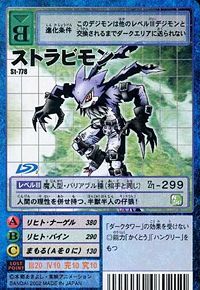 Strabimon is only obtainable as a collectible card. 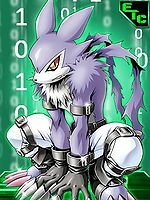 Its card is part of the Wolfmon Evolution (ヴォルフモン進化 Vorufumon Shinka) set. 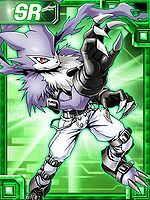 Strabimon is available as a Digimon Medal. This half-beast, half-human Wolf Kid possesses the reasoning of a human! This page was last modified on 22 March 2019, at 21:01.